HO Hup Construction Company Bhd wants to further expand its ready-mix concrete business and re-enter the construction market as part of a revised regularisation plan. Executive director Derek Wong said the company cannot depend solely on a 24.2ha freehold land in Bukit Jalil now in contention at the Federal Court and therefore needs to form contingencies to keep it running. Ho Hup had filed a suit in 2010 to declare a joint development agreement between its 70 per cent unit Bukit Jalil Development Sdn Hd (BJD) and Malton Bhd's Pioneer Haven Sdn Bhd, as null and void. Ho Hup was granted leave to appeal to the Federal Court on May 17 this year after the Court of Appeal had in December last year overturned the decision by the High Court, giving it full rights to develop the land. "If the Federal Court hearing is not in our favour, the company is looking at other avenues to regularise our financial plan. "We have been doing that in the last three to four months since the Court of Appeal reversed the decision," Wong said after the company's annual general meeting here yesterday. "Moving forward, Ho Hup will be looking at leveraging on its track record and competitive strengths to bring in new projects and expand ready-mix concrete division, which has shown significant improvements in performance," he said. 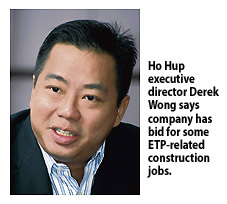 Wong said the company has bid for two or three medium-sized Economic Transformation Programme (ETP)-related construction jobs. In line with the increasing construction activity in the country, Ho Hup plans to expand its concrete business to two or three more locations in the Klang Valley and is scouting for a suitable location in Johor. He added that its concrete operations, which grew by 50 per cent year-on-year in 2011, are expected to perform similarly this year. It was learnt that Ho Hup is talking with several parties to develop properties on a joint venture basis. Ho Hup will apply to Bursa Securities for a further extension of time, beyond June 30 2012, to submit its revised proposed regularisation plan. Ho Hup had in July 2011 submitted a proposed financial regularisation plan to Bursa based on full rights to develop 24.2ha owned by BJD. Wong expects the Federal Court ruling on the land matter to be made in August. On the High Court order to buy over Zen Courts Sdn Bhd's 30 per cent stake in BJD, Wong said both parties will appoint an independent valuer next week to fix the final purchase price.